The Starlight Essences are unique in their effect, as with their clear light they allow an insight into the entire being, into your own development path and illuminate all hidden corners and areas, so that it becomes easy to joyfully stimulate your own life flow and be able to follow it. 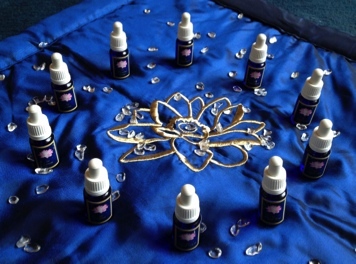 The complete essence system consists of 124 essences. There are essences for the physical, emotional, mental, causal body. Others bring divine qualities into your system. The experienced Starlight Essence Therapist will be able to apply the right essences for you, so that your issue can be resolved and you can find peace. Depending on what your goal for the session is, you can become more settled in yourself, become more relaxed, find healing or gain insights. It really just depends on you and your outlook. During a treatment session, you will make a selection from a range of essences for a particular theme, which is of concern to you. This could be anything from physical ailments, mental conditions, emotional imbalances or spiritual issues. Your Starlight Essence Therapist will then consult you on your choice, and use some or all of the essences as part of the treatment. It might also be appropriate to make a full selection from the entire collection of essences to create a healing mandala. Healing mandalas are capable of bringing about deep transformation and encourage healing to take place. To book in please get in touch.